Continuing my journey eastbound along the Southern United States brings me to New Orleans. After checking in to my AirBnB, I decided to head down to the all famous French Quarter to see what’s up. After eleven years, New Orleans is still rotting from Hurricane Katrina. Run-down and boarded up buildings sprinkle even the most touristic and popular corners of the city. However, the spirit and character is still alive and well. I hit up 30/90 to grab a pint and to sample some local cooking. Some of the classic New Orleans fare included: Alligator Po-Boys, Chicken and Andouille Sausage Gumbo, Crawfish Étouffée, and Oysters done a dozen of ways (including: baked, fried, BBQed, etc…). 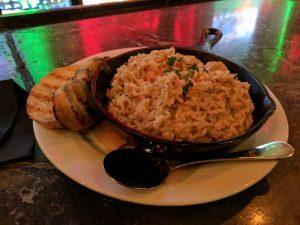 Their take on a poutine was also interesting: Beer Battered fries topped with crawfish étouffée and sprinkled with Parmesan and Romano cheeses. I settled on the Chicken & Alligator Sausage Jambalaya. Moving north along Frenchmen Street, I walked into The Spotted Cat, which was another place that was recommended to me. The standing room only club was pumping with a killer jazz quartet. The singer was able to wail out our lyrics without the help of a microphone. The musicians are paid on tips only, so it’s important to drop a few dollars in the collection cup if you enjoyed the song. Lousiana is one of a handfull of states in America to not have a state minimum wage. This means that they fall under the federal minimum wage of $7.25/hr. However, tipped employees (like those working in bars and restaurants) make a paltry $2.13/hr! I’m moving from my AirBnB to the Auberge Nouvelle Orleans today. I’m going to fill that annoying time between check-out (11 am) and check-in (3pm) place by doing laundry. Oh, the glamorous life of a backpacker.